Australia meets Asia at this smart all-day dining spot. What the Dickie? Yup, it’s an Australasian restaurant in Fitzrovia. That’s Austral-asian, as in, Aussie-meets-Asian-fusion, so don’t come expecting kangaroo steak or aboriginal prints. Instead, the decor is contemporary (perhaps too contemporary – I’m not sure there’s ever a time for banana-yellow seating) and there’s a menu much like that of a fashionable Sydney restaurant. But the cooking? A mixed bag. The best dishes came from the Asian (specifically, Japanese) side – plump lobster and prawn gyoza; the terrific tuna tataki. From the more ‘Aussie’ camp, top marks only went to one item: the brilliant – and brilliant-value – lamington, which comes sold as an oversized petit-four for a mere pound (a pound!). But elsewhere, there were lacklustre chicken ‘poppers’, too-hard fries and a too-oily piece of halibut with a flabby skin, teamed inexplicably with an also-oily ‘yuzu’ hollandaise. I adored the Aussie-slang-themed names of cocktails (U Beaut, She’ll be Apples), but my Choice Bro lacked depth. Still, the room was buzzy and service well-meaning. So maybe, if the restaurant’s kitchen can just up her game a bit, ‘she’ll be apples’ after all. Dickie Fitz, located at the top of Fitzrovia, markets itself as Austral-asian (Australian/Asian fusion) with certain dishes notable for this in their main menu. I, however, have had my eye on their brunch menu ever since they landed so secured a table for 3 on Saturday at 12:30pm. We were lucky enough to go on a beautiful sunshiney day which made the open, contemporary space zing summer vibes - with the door open and a few people sitting al fresco. They serve brunch all day Saturday and Sunday with a pricey but delicious menu, plenty of savoury items, a few sweet items like pancakes and waffles and an extensive coffee, juice and cocktail menu. It was extremely hard to choose so I went for a savoury to start and then dessert. My feta, avocado and kale on sourdough was delicious and generously smothered in avo. The waffles were also fab with a delicious peanut crumb on top. What really impressed me was the friendly service. A lovely ambiance and delicious food! I recently went for brunch with a few friends. Located in the middle of Fitzrovia Dickie Fitz is an upmarket restaurant with prices to match. They are known to be Australian, but the food on the menu is your traditional fare. The interior is well lit with funky metal spheres for lights, the light coloured walls mirrors and big windows all help too. The seating is in comfy padded chairs and some are booth style with a large stair case heading to an upstairs area that can be hired out. The staff were very attentive and friendly and as I'm not an egg eater they agreed to swap my egg on the hot salmon for some avocado. The dishes are well prepared and of a good size, as well as the salmon I opted for waffles for dessert with my friends joining in. Both dishes were tasty with nicely fluffed waffles. I'll definitely be going back for more and would love to try out some of the other dishes. I've walked past Dickie Fitz about a hundred times and always wanted to go in - mainly because their decor is amazing and, in the summer, they have some pretty impressive outdoor seating that could kind of trick you into thinking you were whiling away an afternoon in Morocco rather than sat on a busy street in central London. So it was first on my list when asked to suggest a dinner venue that was suitable for my entire family (including grandma - so no stools, no banging music, no teeny tiny booths). I'd definitely go back. We had a lovely dinner which was enhanced even further by the thoughtful staff. My mum is a recently converted vegan and as such is not used to checking menus for food options. When we arrived we realised there was nothing bar a side salad that she could eat. So the chef put together two courses just for her with minimal fuss and plenty of flavour. That's pretty great service in my opinion. As for the rest of us, we stuffed our faces with fresh fish, lobster gyoza's and spatchcock poussin. It was all delicious. I'd definitely go back, especially to work my way through their impressive gin menu! I enjoyed my time at Dickie Fitz although I probably wouldn't come rushing back. 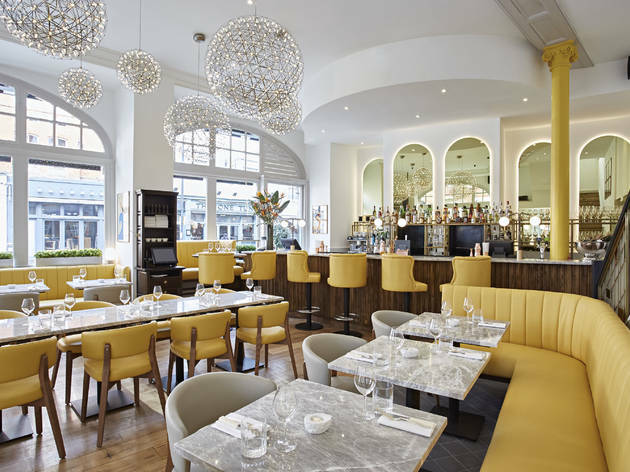 The interiors are sleek and contemporary with marble tables and yellow leather seatings. Together with white walls, it's a vibrant place to be and in the day, it would be a great place to have your brunch, especially when the sun is shining and fills the room with natural light. There are two floors so there's plenty of seating and it's not too far from Goodge Street station too so you'll always be able to catch the last train home. If you enjoy a fusion food (and t Dickie Fitz, it's where Australia meets Asia) then I think you'll enjoy this. I enjoyed my lunch at Dickie Fitz though probably won't be rushing back, other than for some stunning interior design inspo. If there's one thing these guys have got right it's their decor. The yellow leather banquets and the sleek marble table tops are stunning. The light fixtures are gorgeous and the bar looks chic and summery. The food... is pretty good. I had the burger and it was juicy and succulent, though many of the dishes are a little more expensive than they probably should be. We booked for 12.30 on a Saturday afternoon, and I was expecting a brunch menu which we weren't offered, and the place was also completely empty. Their coffees are good though, with a silky smooth flat white giving me the briefest semblance of brunchiness that I was after. Everyone knows Aussie's do the best brunch, so when this opened around the corner from my work recently I was super excited to try it. I loved the decor from the second I walked in. 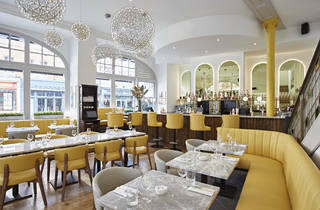 Creamy yellow leather benches and scoop back chairs, modern, eye catching lighting, opulently laid marble tables and streams of light flooding in. Unfortunately the food didn't match up to the decor, however, on my visit. I went for breakfast, and it is definitely not your traditional breakfast menu. Not an eggs benedict or full english in sight. Now I am all up for trying 'new' things, and although it takes a lot to make me branch out from my standard avo on toast order, I am more than happy to do so. This, however, unfortunately made me question ever branching out again as it was disappointing. I went for the smashed avocado with charred tomato, kale, feta, grilled sourdough and a side of bacon (you have to order the bacon per rasher which seems a little bit of a rip off!) The kale was over cooked (and as much as I like my greens, I am not sure kale at breakfast really works), the poached egg was undercooked and overall it was one of the saltiest dishes I have ever tried. There were 5 of us dining and every single person commented that their food was incredibly salty. I would have loved to wash it down with some water, or order a juice to quench my thirst, but after our initial order the waitress never came over again to top up our drinks or see if we wanted it anything else. Service was also incredibly slow. Our food took nearly 40 minutes to arrive, which, for on a weekday in an area where lots of business breakfasts take place is far from ideal. Such a shame, as I really thought I was going to love it. As it is so new, perhaps it is having some teething problems and will improve, but until I have heard it has I don't think I will be returning. On the plus side, the coffee is very good, so perhaps just swing by for a caffeine fix. We haven't even had a chance to go! Getting information about Christmas menus has been like pulling teeth. I've been messed around about menus, prices and dates for about a month and have now been told our plans are not feasible based on party size. Would not recommend if you're planning a meal for a group in the festive season!